Hates reproof…That bowing up I get when someone tells me I mis-spelled a word on my blog or that frustration that surges through me when my husband reminds me I didn’t speak kindly. Um…often I hate reproof. I hate to be wrong…ever. I can say I love it when I discipline myself. I love the results, the peace, the semi-organized state it helps me achieve…But the discipline itself?! God in His infinite wisdom is having me work on discipline this year….We are nearly half-way through the year and I don’t love it and really I don’t have it in my life. I want to love it. 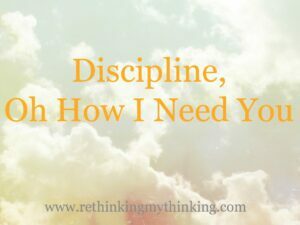 I want to love discipline…I want to appreciate the concerted effort discipline creates. The kind that means all I do in the day has purpose. Hope that God’s Spirit will continue to work in my life. Hope that I with God’s grace I will not quench the Spirit’s work so He can grow the fruit of self-control in my life. Hope that I will learn to love discipline and reproof. Father help me learn to love discipline and reproof. May I no longer be stupid, but truly love knowledge. Grow in me self-control, discipline, and a teachable heart. In Jesus’ Name I pray. Amen. This entry was posted in Rethinking Challenges, Rethinking Christian Life, Rethinking Faith. Bookmark the permalink.